Simply soak in salt water to defrost and use in making stir-fries, stews, fried foods, marinades, and grilled dishes. These fresh spear squid are caught in the South China Sea off the coast of Vietnam, then promptly cut up and the cuts frozen. The cuts are bite-sized and easy to eat; and because they are frozen separately, they can be used in making a broad range of dishes. Sugarlady’s seafood is caught in season and processed right away, ensuring that you always receive the highest possible freshness and flavor. Because this squid comes ready to use, the amount of time you need to set aside for preparing seafood dishes can be drastically reduced. In addition, because the squid comes frozen, it is easy to have plenty of it on hand at any time without worrying about it spoiling. Sugarlady’s seafood and other frozen products allow you to cook meals from all sorts of real, nutritious ingredients whenever you desire, even on the busiest of days! How to defrost: Remove the squid cuts from their bag and soak them in salt water (500ml of water with 1 teaspoon of table salt mixed in) to defrost.Once they have defrosted, pat the squid cuts dry. They are then ready to use in your recipes of choice. 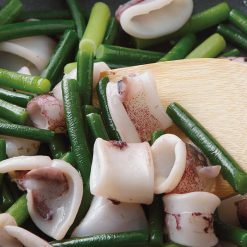 Squid is a versatile ingredient and can be used to make a variety of traditional Japanese foods such as ikayaki (grilled squid with sauce), as well as everything from Chinese stir-fry to Italian stews and pasta salads. 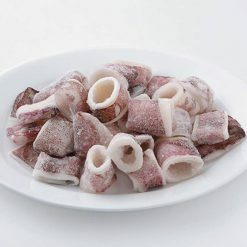 These squid cuts can also be deep-fried or used in marinades.Note: On rare occasion, there may be cartilage in the squid. This cartilage is not harmful if ingested, but please use caution. This product contains spear squid (Vietnam).. Origin of ingredients: spear squid (Vietnam). Prepared and packaged in Vietnam.